The problem and the cure! 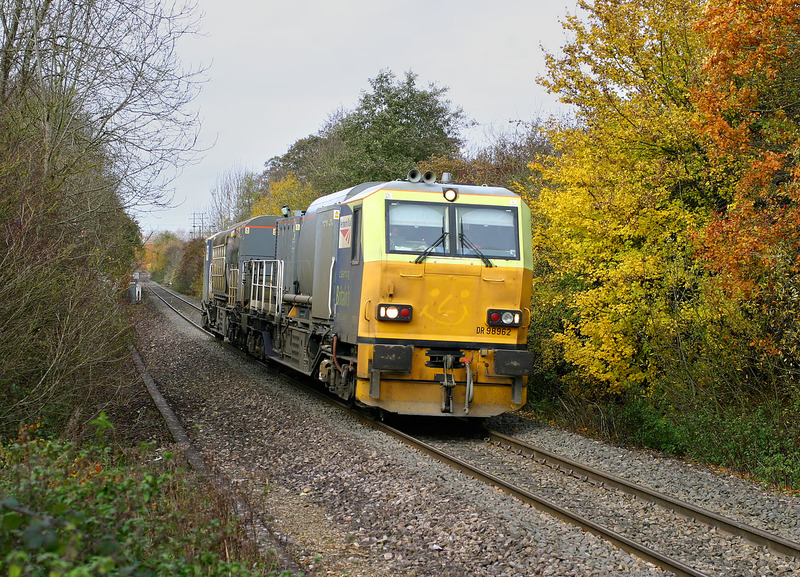 MPVs DR98962 & DR98912 pass a good show of autumn leaves at Finstock on 9 November 2008. The working is the 3S31 09:55 Kings Norton to Ledbury (via Oxford) Rail Head Treatment Train, especially designed to deal with fallen leaves from trackside trees such as these. The leaves looked even more impressive until the sun went in a few minutes before the train was due! Due to pathing difficulties on the single track sections of the Cotswold Line, the 2008 timetable for these trains sees the weekdays workings running during the night, with only this Sunday working running during daylight. Finding a location to include show of autumn leaves on the Cotswold Line is not as easy as you would think from looking at the map.